Nairobi, a world-class city of commerce, culture and contrasts, is energized by a growing and demanding middle class. Pulsating with the creativity and aspirations of a youthful population, Kenya's dense regional cities are also gaining economic momentum. Kenyan runners are helping to make this happen. In the dusty haze of early evening, they seem to float above the ground, lean, rhythmic and completely focused. The young athletes of Kenya's North Rift region plying the side of the highway, some barefoot, are training not just to become competitive long-distance runners. In fact, with the help of their dedicated coaches, they are aiming to win every race they will ever enter, to shatter international records into oblivion -- to become unstoppable, perpetual world champions. That's just the way northwest Kenya rolls. The month of April kicks off a new season of marathon races across the Global North. First up in North America is the legendary Boston Marathon, followed by races in Toronto, Vancouver, San Francisco and, later in the year, New York City. Nearly 70 long-distance contests are scheduled this year in all parts of greater Europe, led this month by marathons in Paris, London, Milan, Rome and Copenhagen. Kenyan runners have been a dominant force in these races. Take the case of the Boston Marathon. Over the past 30 years, Kenyan men have won that event a remarkable 20 times. 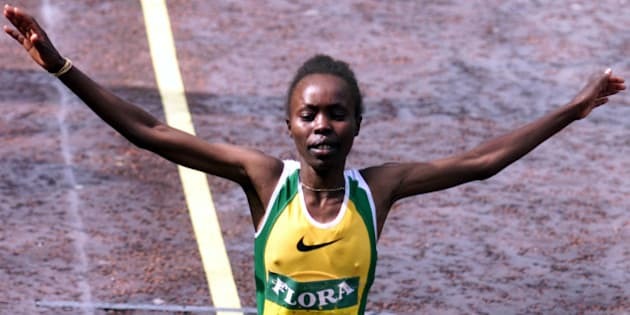 For their part, Kenyan women have won that race on 12 occasions over the last two decades. These are spectacular achievements for any country, and even more impressive for a developing nation. And Kenyan runners have achieved this level of success in races everywhere on the globe. Kenya is making progress in other ways, too. Despite widespread political corruption, frequent tribal conflicts (often fomented by venal, destructive leaders), and a series of terrorist attacks, Kenya has become a regional economic hub for trade, technology, finance and logistics, and Africa's third-most important economy, behind only South Africa and Nigeria. Nairobi, a world-class city of commerce, culture and contrasts, is energized by a growing and demanding middle class. Pulsating with the creativity and aspirations of a youthful population, Kenya's dense regional cities are also gaining economic momentum. Kenyan runners are helping to make this happen. True, as in all sports, some of these athletes have made bad decisions with their money. However, executing their cultural duty, many have distributed some of their income from sponsorships and prizes to their extended families, making new capital available to improve houses and expand businesses in their home communities. At the same time, a growing number of the athletes have also placed their money in investments outside the sphere of the family, especially in major real estate projects -- hard assets they can see, touch and even live in. Coming into the city of Eldoret, for instance, you can see a gleaming new apartment complex that is said to be financed by runners from the area. Until recently, the national government offered these athletes a tax holiday in order to encourage such projects. Today, that tax break is gone, but the runners' investments keep coming. Some of the athletes give back in another, even more important way: by building peace. In a region wracked by spasms of ethnic conflict that often coincide with election campaigns, peace runs provide an important public declaration by these influential public figures that warriors should disarm and elders should negotiate productive ways for all groups to co-exist. These runs were initiated more than a dozen years ago, but gained new urgency after widespread violence during the 2007 national election. More recently, in 2014, the Tegla Loroupe Peace Run in the town of Kapenguri attracted 2,700 participants from the ranks of the top runners, politics, youth groups and the communities implicated in past conflicts, and was sponsored by Kenyan telecom giant Safaricom. The previous year, a university-led peace run in Eldoret, held just weeks after the terrorist bombing of a mall in Nairobi, drew 5,000 participants. Perhaps the most innovative and sustained peace-building work has been led by Tegla Loroupe, the first African woman to win (in 1994) the New York City Marathon and the holder of several world records for the half-marathon. Born and raised in the Rift Valley and now retired from competition, Ms. Loroupe has served as a spokesperson for the United Nations, the Olympic Committee and the NGO Peace and Sport on peace, women's rights and education. Among her many assignments around the world, she served as Oxfam peace ambassador on Darfur in 2007 with actors George Clooney and Don Cheadle. Today, Ms. Loroupe devotes her time to the activities of the Tegla Loroupe Peace Foundation. In addition to organizing peace runs, the foundation operates a primary school for students at risk of HIV/AIDS, FGM or becoming child soldiers in local conflicts. With support from the UN High Commissioner for Refugees and the International Olympic Committee, the foundation also runs a training centre for refugee athletes from conflict zones across the Horn of Africa who aim to compete in the 2016 Rio Olympics. In 2010, Ms. Loroupe was honoured by the Kenyan government for helping to negotiate the laying down of guns by 700 Rift warriors. Last month, she received the Father John Kaiser Human Rights Award, presented by Kenya's Chief Justice, Dr. Willy Mutunga. The long-distance champions of the Rift Valley remember where they came from. They are inspiring a new generation of runners to succeed in the most important marathon of all: that of achieving a durable peace.